Did you know that if you own a home in Scottsdale, AZ you are more likely to own a pool than almost anywhere else in the United States? According to recent data collected by Realtor.com, Scottsdale ranks second in the nation for homes with swimming pools! As a pool owner, you know it’s a big responsibility to keep your pool in crystal clear condition and most of this relies on your pool filter. That is why it is crucial to maintain a well-functioning pool filter and why we are listing the most common filter issues we see to help you detect problems and fix the pool filter right away. Do You See Dirty Water Flowing Back Into the Pool From the Pool Filter? If you are visibly seeing cloudy water coming into the pool from the return or the pool jets, then you most likely have a filter issue. This could be caused by a number of reasons but best case scenario it is due to a bad filter valve or spring which is easily repaired. Another possibility would be dirty or worn out DE grids or cartridges that need to be cleaned or replaced. We would suggest calling your local pool service to have them inspect your filter which may require disassembling it to make sure all the parts are in working order. Most commonly the issue of dirty water coming into the pool is due to a sand filter and old sand. The sand in your filter needs changed about every 5 years since over time, the sharp edges of the sand that are responsible for catching debris and ‘cleaning’ the water are naturally rounded out by the flow of water. Plus, the hard water in Arizona causes the sand to calcify and oils and dirt collect in the sand. This can be fixed by having a sand change in your filter. It is important to address this issue right away, especially in the heat of summer, since sand filters take longer to clear your pool water once an issue starts. If the Filter Pressure is Reading Too High, Does it Need Repaired or Replaced? High filter pressure can cause parts of your pool filter to crack, including the tank so you don’t want to dismiss an issue like this, especially since there have been rare reports of high pressure blowing the lids off of the pool filter! Usually nothing this dramatic happens and the pool filter just needs some parts replaced but in some cases the entire filter will need replaced if there is any type of crack or pinhole in the filter tank. If you own a sand or DE filter they require backwashing so if your pool filter pressure gauge is reading too high then it may simply mean it is time to backwash the filter. If the pressure is still high after that, there may be other issues like clogged plumbing lines or simply a bad pressure gauge. When you turn the filter off check to make sure the pressure gauge goes down to zero and if not, you may just need to replace the gauge. The filter may also be overworking if the size of your filter is too small compared to the size of your pool pump and a trained pool expert would be able to quickly look to see if that is the case. Another cause for high pool filter pressure would be dirty cartridges, old sand or worn DE filter grids. Do you notice a pattern here? As mentioned above, if you don’t keep the parts of your filter in tip top shape and the cartridges or grids clean, then how can you expect it to clean your pool water properly? What Type of Repair Fixes the Pool Filter Pressure Reading Too Low? Problems with the pool filter pressure being too low is that it can cause the pool water to circulate improperly. This leads to dirt or debris settling or chemicals not being disbursed properly and then the dreaded murky water or green pool issue arises! 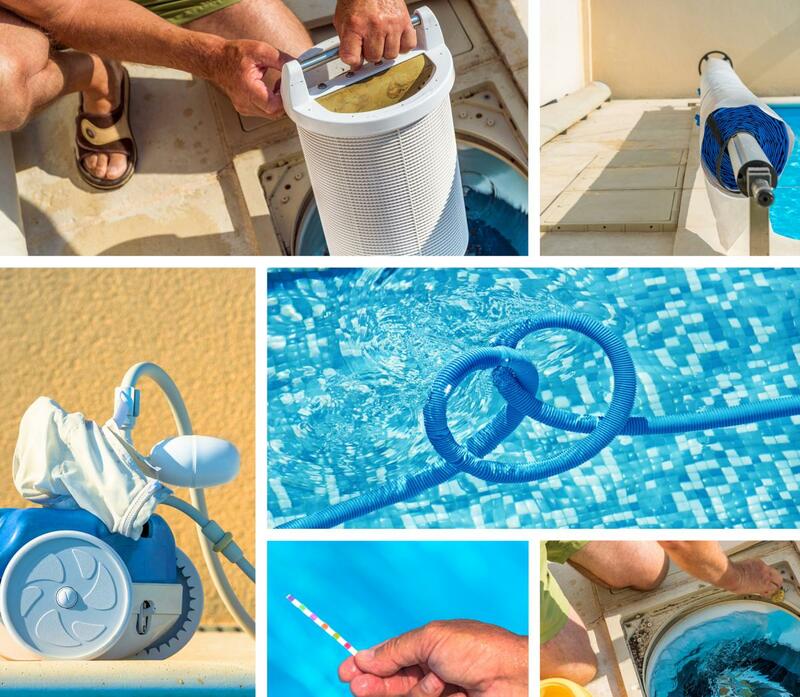 The usual suspect is a clogged pool skimmer or pump strainer basket which is an easy fix. Once those are clear, if the pool filter still has low pressure then check to be sure the pool water level is normal. Low water levels happen especially in the summer when pool water evaporates rapidly and not enough water will cause low flow to the filter. As noted above, it’s always good to double check that the pressure gauge is actually working properly too! A bad gauge will give an incorrect reading but at least it is a simple fix. As you can see, there are many parts that make up the different types of pool filters and it can take a bit of troubleshooting to get to the root of an issue. We are always up to the task though so if you have an issue with your pool filter or even if you’re not sure what type of pool filter you have, feel free to contact us!